Heat up 1 tbsp oil in wok and saute the fermented red beancurd until fragrant. Add some water from 500ml, follow by Chinese cabbage, fry awhile and add in the balance ingredients. Then add balance water and seasoning and bring to boil. 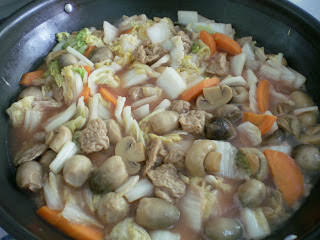 Cover with lid and simmer at medium fire for about 20 mins. Lastly thicken sauce with corn flour water. Hi Ai Li, Yes, you can cook half of this recipe. In fact this dish can be kept for 3 days in the fridge. Oh, reads very easy, I will try – provided I find the right ingredients. Pigpigscorner: I agree that this is good to go with rice and easy to prepare too. Love red bean sauce! This is perfect with rice. You're most welcome to Singapore whenever you've go the time. Please feel free to drop a few lines. I like this dish a lot. I just learnt abt using red beancurd in this veggie dish from my MIL not long ago. Nice felt to vist this site that really impressed me a lot……. I miss Singapore and its flavors … oh, wish I could go back! thank you for bringing the taste of the local cuisine, I love it! Never cook this before. Will try out when coming 9th day vegetarian festive （九皇爷诞）. Usually I will cook 罗汉斋 on the 1st day of CNY, no other day in a whole year, hehehe. I think when I run out of idea what to cook, this will denitely my choice. Wow, I like this dish!!! too bad my husband doesn't like the taste of Nan Ru so I can't cook dishes with it. Tracie & Peachkins: Thank you! I love soup and mushroom. I think I'm going to love this! I like this one!! somehow it reminds me of chinese new year.. where grandma cooks vege and rice for breakfast! the only time I would actually eat rice as breakfast.. I would love to try this… I hope I can find the ingreadients here. Ashley: My family likes more sauce to go with rice. Can add less water (300ml) if you don't like watery. Mock abalone is a vegetarian and health food. It is generally made from wheat gluten and is thus high in protein. Very interesting and delicious sounding….never had mock abalone. Lots of great flavors here! Oh! Hurry up! Get me a bowl of rice to go with this dish. Ump…Yummy!!!! y ur dish so watery 1??? Never heard of this dish before but looks gorgeous. Pretty presentation Anncoo. Bravo. This is very similar to 罗汉斋,I just grab whatever I have at home~~quick and easy. Ooohhh.. i miss this so much.. 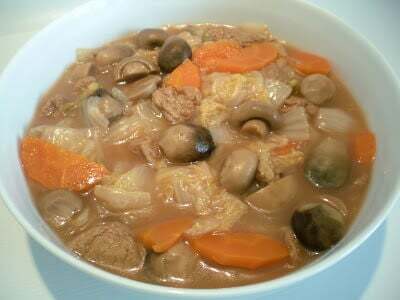 This is a must dish on the first day of Chinese New Year in my house, and my mum cook it frequently too on our request..hehe.. I'll ask my mum to add in the 冬粉 and i can finish a whole big bowl.. haha! !